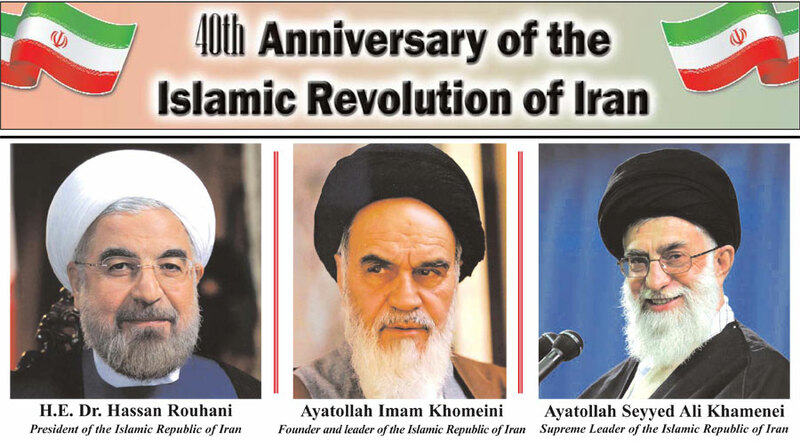 I, as the Consul General of the Islamic Republic of Iran in Karachi, offer my best felicitations to the Great Leader of the Revolution Hazrat Ayatollah Khamenie, the Honorable President Dr. Hasan Rouhani and all my dear Iranians and compatriots residing in Pakistan upon the advent of the 40th anniversary of the victory of the Islamic revolution. The historical, civilizational and cultural backgrounds of Iran and Pakistan, on one side, and the geographical position and proximity of the two countries, on the other, have proved to be highly instrumental in attaching the people of Iran and Pakistan so closely the each other and also in giving much strength and stability to the diplomatic relations between the government of the two countries. Another factor behind the interwoven relationship is that Iran was the first country which had recognized the Islamic Republic of Pakistan and Pakistan was the first country to recognize the Revolution and the Islamic Republic of Iran. In view of the facts stated above, the authorities in the two countries have decided that their embassies and consulates general act as a source of further strengthening and consolidation of these warm relations. Ergo, I take pride in announcing that the Consulate General of the Islamic Republic of Iran in Karachi, in unison with the other diplomatic missions of Iran in Pakistan, will take all-out efforts for having a very friendly and cordial ties with the honorable local authorities, particularly the provincial rulers, Chief Minister, Assembly Speaker, ulema and religious leaders, business community specially the FPCCI and KCCI, media, public and different communities and will leave no stone unturned for further strengthening and cementing of the existing relations between the two countries. The exchange of visits over the last two years by the President, Speaker of the Islamic Consultative Assembly, the honorable Foreign Minister and a large number of Iranian authorities to Pakistan and Pakistani authorities to Iran is the glaring example of the depth of relations and the level of understanding that exist between the two countries. These visits also reflect the positivity of direction in which the bilateral relationship between the two countries is moving. 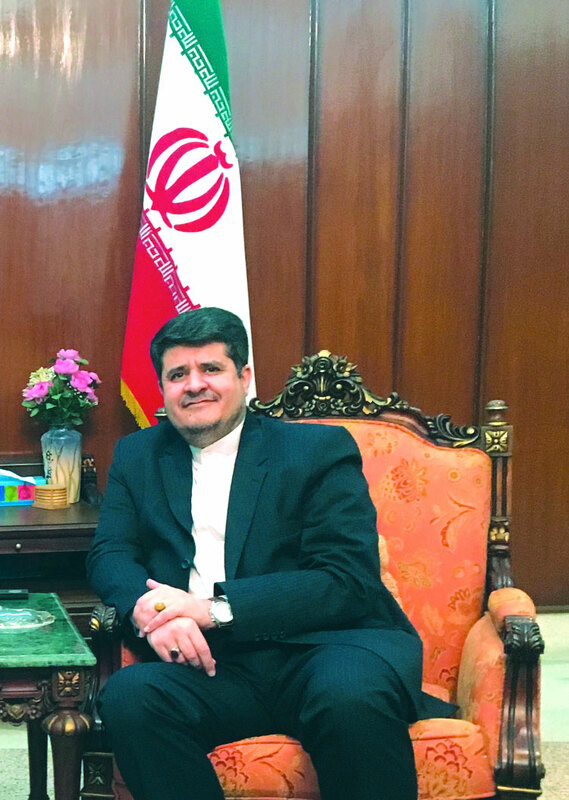 In the field of trade, Iranian and Pakistani companies have always had an active presence in exhibitions of the two countries and have made good agreements with each other. Apart from holding of a solo exhibition by Islamic Republic of Iran in March 2017 in Karachi and the active presence of Iranian companies in various exhibitions in this country, Iranian companies had an active presence in various exhibitions in Karachi and similarly Pakistani traders also actively took part in various trade exhibitions in Iran. This fact reflects the vast potentials that the two countries have for growth of their bilateral exchanges and these potentials must be utilized properly to its maximum. 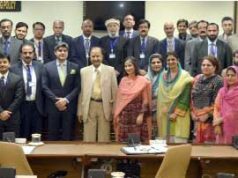 One of my main duties and that of my colleagues at this Consulate General is to assist and facilitate expansion of relations and cooperation in diplomatic, economic, trade, educational, academic and cultural fields between Iran and Pakistan, particularly expansion of trade with the province of Sindh. Therefore, all efforts of my colleagues will be focused on ensuring access for trading sides to each other’s markets. 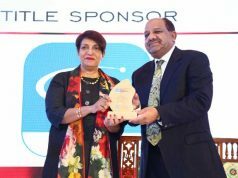 For this reason, this Consulate General and its commercial section, in pursuance of the objective of as much blossoming of relations as possible, welcome any cooperation from the business community of Pakistan including Karachi and furnish all necessary information to them together with vows for all necessary support and assistance. Similarly, taking into view the cultural wealth and tourism potential of the two countries, we encourage travels for pilgrimage and tourism between the two countries. Willingness to serve the Pakistani pilgrims who love and are keen to visit the holy places in Iran, and facilitating their travel to my country is one of my glories. I want from the respectable pilgrims not to lose opportunity for taking a tour of Iran and seeing the remarkably beautiful places there. They must add visits to wonders of creation, nature, architecture and art in Iran to their pilgrimage itinerary. I have a firm hope that during the current year too, the friendly relations and cooperation between Iran and Pakistan would expand further and new advancements would be witnessed in their bilateral ties. Iran had an estimated Gross Domestic Product (GDP) in 2017 of US$447.7 billion, and a population of 80.6 million people. Based on Gross National Product (GNP) ranking published by World Bank in 2016, Iran ranks 18th. The last ranking of the International Monetary Fund (IMF) was released in 2017. Nevertheless, Iran’s position didn’t change and the country retained its places as the 18th economic power of the world. The BP Statistical Review of World Energy 2018 with data at end-2017 places Iran fourth in proved oil reserves and second in natural gas. In 2017, Iran shipped 777 million barrels of crude oil which represents an average daily export rate of 2.13 million barrels, 62 percent went to buyers in Asia. The rest was sold to European customers. After the US re-imposed its illegal sanctions in 2018, Iran recorded a non-oil trade surplus of $1.94 billion in the eight months ending Nov. 21, 2018. According to the UN Human Development Report, between 1979, the first year of the Islamic Republic till 2016, this average has been the first to increase the index of human development. The average growth rate of the human development index in the world is between 0.69 and 0.73. Iran’s growth is more than twice the global average and represents an annual growth of 1.6. Today, the leading organization which calculates the Gini Index of the countries is the World Bank. A Gini coefficient of zero expresses perfect equality, where everyone has the same income and there are no social class differences. In 1965, Iran had a Gini coefficient of over 0/502. In the 1970s the index reduced to 0/495. Whereas during the 40 years after the Islamic Revolution, the Gini coefficient has constantly increased from 0/4 to 0/37 in 2014. Energy development index is a global means of assessment which is meant to determine how energy influences human societies and how much they develop as a result. Based on the data released by IEA, the Islamic Republic of Iran ranks second for the Energy development index. Before Islamic Revolution, we can see that only 4,350 villages have access to electricity power. Whereas after the Revolution, 99% of rural population in 52,520 villages enjoyed an easier life thanks to the presence of electricity. Moreover, after the Revolution, for the first time, people in all the cities of Iran could use electricity in their homes. The same thing happened in Iran regarding natural gas. Before the Revolution, in the entire country, only 50,000 households living in five different cities used natural gas. Whereas in the years following the Revolution, 14 million households used natural gas. Besides, for the first time, villagers also could use natural gas as a source of energy. Today, more than 10,000 villages have access to natural gas. Based on World Resources Institute (WRI) analytical data, Iran, among other 195 countries all over the world, ranked 13th in grain production. It means that Iran is one the major grain producer in the world. Food and Agriculture Organization (FAO) of the United Nations also ranked Iran as the 12th largest wheat producer and 14th largest barley producer. Hence, Iran is the first and largest exporter of agricultural products like barberry, pistachio, caviar, and saffron in the world. The country is also the 2nd largest exporter of date and apricot. Iran is ranked as the 3rd exporter of other fruits like cherry, watermelon, melon, apple, and fig. According to the United States Geographical Survey and the British Geological Survey, Iran is the largest producer of turquoise and the 3rd producer of plaster in the world. Iran also ranks 3rd in the world for the production of ornamental and construction stones and is ranked 8th for the production of iron. The country also ranks the world’s 12th largest producer of cooper and 14th largest producer of zinc. Iran’s steel production flourished only after the Islamic Revolution and the rate of growth was 18 times more than the world’s average rate. So, currently, Iran ranks the world’s 13th biggest steel producer. As cited on the website www.globalcement.com , in 2018, Iran ranked 8th among the top 100 cement producer countries of the world. Among all countries all over the world, only 20 countries manufacture over 1 million cars every year. In 2017, Iran manufactured 1/5 million cars and was ranked 16th in the world for manufacture of cars. Iran’s automotive industry, in addition, has influenced other industries. Today, approximately 1,200 companies together with 15,000 factories are producing auto parts and over 39 countries purchase Iranian auto parts. From 1886, when telephone was first imported into Iran, to 1979, the year the Islamic Revolution triumphed; it means during 92 years, 850,000 telephone numbers were issued. Whereas in the years between 1979 and 2017, 30 million telephone numbers were being used in the country. Before the 1979 Revolution, only 312 villages had telephone lines. After the Revolution, on the contrary, more than 55,000 villages have been given telephone lines. In today’s Iran, 74 million people have mobile phones and so the country is ranked number 22 among the countries of the world. Internet was made accessible in Iran in 1993 and the first ADSL started operating in 2004. With 100 Internet Service Provider (ISP), Iran is ranked 9th in the world for providing Internet services for users. There are currently around 42 million Internet users in Iran. And so from this viewpoint, the country ranks 17th in the world. From 1912, when railway was first run in Iran, to 1979, the year the Islamic Revolution triumphed; about 4,600 Km railway was installed in Iran. Based on data published by International Union of Railways, Iran with more than 11,000 Km installed railways, ranks 21st in the world. In other hand, before the Revolution, Iran has about 49,000 Km roads, including highways, main roads, subway road, and rural road. After the Revolution, during only 40 years, the length of roads in Iran has increased to more than 214,000 Km. so from this viewpoint the country is ranked 26th in the world. Iran has 739 commercial ships and so the country is ranked 30th in the world. While before the Revolution, Iran had only 42 commercial ships. The Hudson Institute, one of the most American famous institutes, close to republican party and President Trump, recognizes Iran to be the 7th great power of the world. The institute report says: “The biggest change in the list of great powers is the arrival of a newcomer: Iran! But the Hudson think tank is not the only international source releasing such ranking. The American Interest is another institute which ranks countries based on their overall power. The American Interest magazine was founded by Francis Fukuyama, a close friend of American conservatives. Now Iran is rank number 7 on the list of great powers of the world by the American Interest. Independent and economic newspapers also share common views. According to the recent report of the leftist newspaper, Independent, published in July 2018, Iran is the 13th great power of the world. The report says: “Iran has moved up in the list compared to 2017. The country, which has one of the largest economies in the Middle East and is of interest to global powers thanks to its oil reserves”. On the other hand, the business and technology news website, the Business Insider, also ranks Iran as the 14th on its Most Powerful Nations on Earth list. The report claims that “Iran has long been of interest to global powers because of its strategic location within the Middle East and its abundant supply of oil and other natural resources. The nation holds a whopping 9% of the world’s oil reserves”. And the US News website gives the 13th place to Iran among the world’s great powers in its Power ranking 2018. This ranking is based on an equally weighted average of scores from five country attributes that related to a country’s power: a leader, economically influential, politically influential, strong international alliances and strong military. The web site www.globalfirepower.com validly provides the world’s military power rankings every year. All the nations of the world use the GFP ranking as a criterion for their war making capabilities. The main indicators of this ranking include: manpower, natural resources, logistic resources, financial resources, geography, navy, the army and the air force. These 8 indicators determine the military power of a country. The 2018 analytical data displayed in this site concerning 136 countries indicate Iran is the 13th military power of the world. After the Revolution, Iran has achieved many military successes, including producing the first Iranian submarine, fighter aircraft, torpedo, and destroyer. Of course it shouldn’t be forgotten that in recent years Iran has been subject to the severest sanctions in history: “The Iran sanctions have officially been cast. These are the most biting sanctions ever imposed, and in November they ratchet up to yet another level” President Trump tweeted in August 2018. It is necessary to note that Iran always utilizes its power and military capabilities only for maintaining its independence and territorial integrity, because the country deeply believes in constructive engagement and solid relationships with other countries, especially neighboring countries like Pakistan.